I hope everyone had a good Christmas and a safe, enjoyable new year. Going into 2005 let me take a few minutes to look back at what we achieved in 2004. 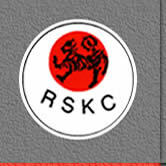 In the Southern Regions, the male team Kumite of Richard, Sheldon and Dave Lee came away with the Gold Medal for the first time in the Club's history. Well done men. Piers McLaren became the youngest ever Black belt in the history of the KUGB, breaking all records. I know Piers will keep on breaking records in the future. Well done to all the squad members who have supported the club in 2004 and won so many medals: Rohan 1st in Shotokan cup, Dave lee 1st in Southern Regions, Richard 1st in Students Nationals, Sheldon 1st in Youth Nationals, to list just a few of our achievements. The Club has even more black belts now than ever. Congratulations to Amina for gaining Sandan (3rd Dan), setting a new record for the club of being the highest ranking female karateka. 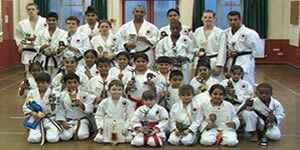 Also to Ken for gaining Sandan, Anthony Thomas (aka TC) and Suraj Jheinga becoming 1st Dan's. Our 2004 annual competition was a great success. Thank you to all who took part, and to all who donated gifts for the raffle : we raised �150, bettering last year's total by fifty pounds. I will post the reply from Cancer UK on our notice board as soon as possible. Thank you all very much. Kata Gold medalists: Richard Bertie, Piers Mclaren, George Howard, Nimrath Panesar, Hardeep Hans. Kumite Gold medalists: Richard Bertie, Rohan Verma, Anthony O'Brien, Aparna Sekhar and Aaron Richardson. Click for full competition results. Congratulations to all.